When you think of of the French Rivera, you think glitz and glamour. Well, that’s what I used think it was all about. It still is. But did you know that it’s very kid-friendly as well? Especially, in Nice. We spent the last two days of our 10 day trip in France in Nice, which is part of the French Riviera. We were also in Nice two years ago for Carnaval. Surprisingly, Carnival de Nice was very kid-friendly a well. It seemed more like a family event as we saw kids dressed up in costume for the celebration. I wish we knew about the costumes then because Luke had an awesome fox costume that we could have used. The second time in Nice was just as fun and memorable as the first time. But this time, we knew what to expect and our way around. 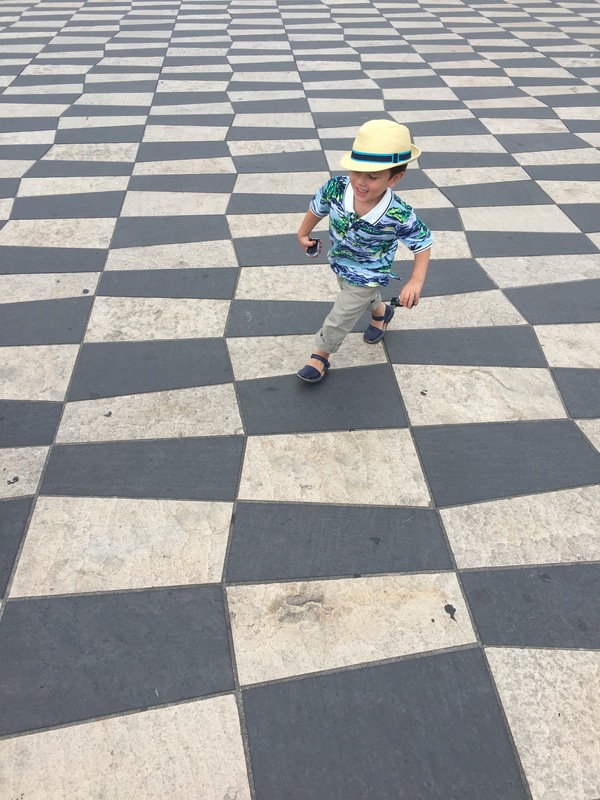 We wanted to make sure Luke got to enjoy the city since he had been such a great sport throughout the whole trip in Lyon and Provence. So we decided to end our trip in Nice because of the parks, pedestrian only streets, food (pasta and pizza for Luke), and shopping (well, that was for me). Place Massena is the main square in Nice. It’s mainly pedestrian friendly but there are trams that run through it. With lots of shops and restaurants, there’s so much you can do. But from a toddler’s perspective, you can run free. And running around is what Luke did. Place Massena also has a water feature area which includes jet fountains. We planned to bring a swimsuit for Luke but that was one thing we forgot to pack. But if the weather was warmer, I’m sure we would have let Luke run around in his clothes. Just a little east of Place Massena are a few playgrounds for babies, toddlers and big kids. I don’t know what it is about Luke and playgrounds but when he sees one, he has to check it out. I remember when we were here two years ago when Luke played in the playground for little babies but this time, he was playing with the big kids. Yeah…really bittersweet because he’s growing up so fast. There’s something about being in France and looking out for carousels. I think I liked them more than Luke because how whimsical they are. But Luke did make a big deal when he saw this carousel. We have to thank a nice family who offered to take a picture of us. If you have a toddler who likes/loves trains, I highly recommend taking the Nice miniature train tour, which starts at Place Massena and takes you all the way up the hill/mountain to the castle. The train leaves every 30 minutes and takes about 45 minutes. We got to spend about 10 minutes at the top of the hill to enjoy the gorgeous view of Nice. Also there is another playground. Unfortunately we couldn’t stay long enough for Luke to enjoy it. I guess next time, maybe? Luke (and Charlie) really enjoyed hanging out at the Port of Nice to see all the big boats and yachts. Okay, I enjoyed it too. Not only were there huge yachts but this area has some beautiful views of Nice. Remember when I mentioned we would be bound to miss something? Well, we didn’t get a chance to go to the beach. I really do want to go one of these days just to enjoy the true French Rivera. Nice’s cuisine is somewhat diverse and not just limited to traditional French dishes. Being so close to the sea, there’s a great seafood selection. But what we discovered the last time we were in Nice is that the city has really good pizza. Who knew, right? Well, it’s because Nice is close to Italy and therefore there’s a lot of Italian influence. So for kids, when in doubt, just order pizza. la Maison de Marie – We stumbled upon it on our first trip and knew we had to go back on our second trip. If the weather is nice, eat in the courtyard. The restaurant is very kid-friendly. Le Petite Cafe – The hotel staff recommended this restaurant and it did not disappoint. We ate off the tasting menu, which also had pasta so Luke was happy. The restaurant is very cozy and contemporary. The staff was very nice to us…even when Luke had a bathroom accident on one of their dining chairs. Boulangerie Patisserie chez Maître Pierre – If you love French pastries as much as I do, I highly recommend this boulangerie. We were lucky enough to enjoy croissants straight out of the oven, which were the best croissants I’ve ever had. We went here after asking the staff at the Chanel boutique for a good boulangerie. They didn’t steer us wrong…and also sold us a great handbag! As we planned to be in Nice for a few days, I picked a hotel that I thought was centrally located. Close to the shopping, parks and Old Nice. We stayed at Mercure Nice Centre Grimaldi Hotel which is part of the Accor Hotels chain. The hotel room art kind of creeped Luke out so we had to put a towel to cover the faces (I didn’t take pictures of it but I think you can see from the hotel website). The hotel is conveniently located near Place Massena and Rue Massena so everything was within walking distance. We discovered that the hotel has a rooftop for guests to enjoy. We took advantage of the rooftop by sipping on wine and juice (for Luke) after a day of fun and shopping. I hope you’re able to take Maya to Nice one of these days! I’m sure she will love it. Or maybe we can all go together! And about the paid thingy…I hope you’re right. But I hope to blog about it less than six months after our trips. LOL!! Time management issues right here..
Take me with you next time…..